By January 7, 2016, 846 of 984 Administration and Finance (A&F) employees had completed their self-evaluations. Hands-on training for performance evaluations began in the Fall; a total of 28 sessions were attended by 184 A&F employees. As of January 7, 2016, 49 annual evaluations have been completed for 2015 by A&F supervisors; 64 probationary evaluations were completed in the system. In December, 2015, 9800 employee photos were loaded into the Talent Development employee profile from the KU Card system. 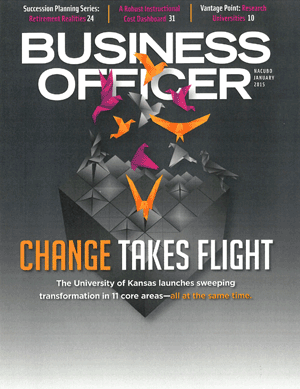 Only 211 employees “opted out” for the generic Jayhawk icon, rather than their photo. The Academic sector and those remaining units outside A&F reporting to the Provost will be integrated into the PMS in 2016 as Phase II of the project. Phase II involves 138 units and 1337 supervisors/employees. Training for goal setting for Phase II participants will occur between January 1, 2016 and March 30, 2016. As of January 7, 2016, 30 training sessions had been scheduled; 68 employees have attended sessions. Nine additional hands-on training sessions for A&F employees to conduct evaluations are scheduled between January 8th and March 1st, 2016.